Every fall, I like to produce a painting of the decorative gourds that are popular in New England during that time of the year. These little gourds come in a wide variety of shapes, sizes, colors and textures, and are easy and fun to paint. I had planned to include them in a still life resting in a long, narrow wooden bowl. As the painting progressed, I settled on a simple wire and woven basket on a mahogany table top. This page shows the steps to complete the work. I have omitted canvas preparation and toning the canvas. These steps can be found under The Painting Process, Sunrise Sentinel or September Beets. Basically, it’s the same process with different colors and subjects. I offer these photographs and a brief description of the steps necessary to complete this work. I encourage you to try to paint a few of these gourds in a simple setting. 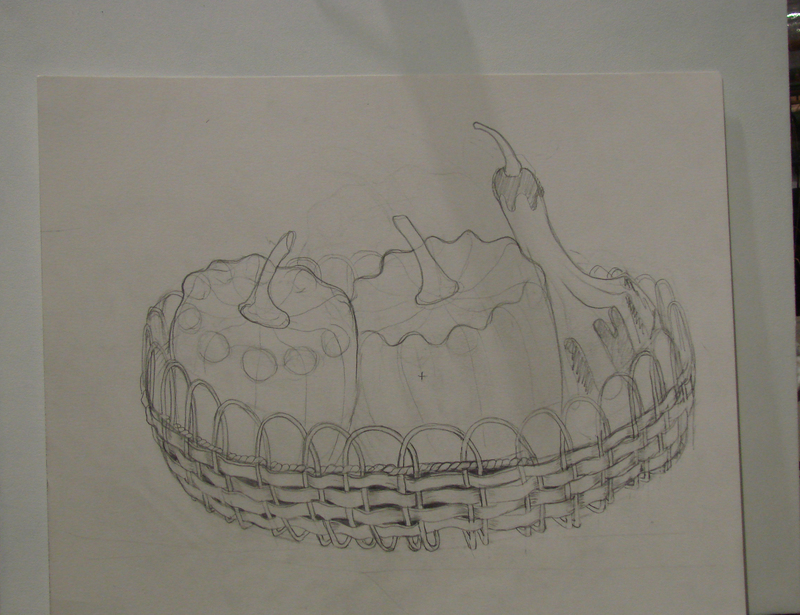 I made a preliminary sketch of three gourds, indicated a basket with a few quick lines, and then transferred it to the canvas with tracing paper. The left gourd is typical of the shape of these gourds. They have ten ribs and ten valleys which radiate from the top stem, run to the edge of the gourd, and then drop off to the bottom of the gourd. I drew an ellipse at the top of the gourd with a ring of ten circles around the ellipse. These circles indicate the location of the protruding, vertical ribs at the top edge of the gourd, and run down the length of the gourd. I drew a line on the middle gourd along the top of the circles raising the line over the circles and dropping it down between the circles to show the edge of the top. This gives you an idea of the basic shapes. The far right gourd had the ten circles midway up from the bottom of the gourd with sharply defined ribs curving from mid-point to the top of the gourd. The cross drawn in the center gourd will be the vanishing point for the bottom of the metal ribs as they bend inward and under to the center of the basket later in the process. I washed the background with burnt sienna. 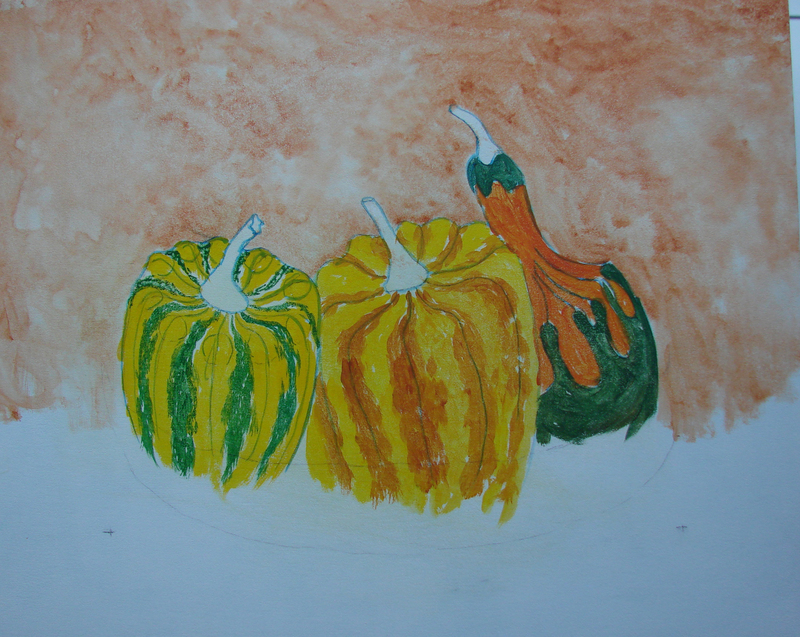 I used cadmium yellow, cadmium orange, cerulean blue, cadmium red and Winsor blue to mix the approximate colors, and roughed in the three gourds. The two plus signs on the canvas are registration marks used to align the tracing paper later in the work. I roughed in the gourds, and then added a wash of violet to kill the original colors I panted on the gourds. The violet wash enhances the next layers of color and makes them richer. I washed some Windsor blue over the right background, and indicated a shadow to the left of the basket. I added a thin wash of Windsor and cerulean blue where the basket casts a shadow. At this point, I had indicated the shape of the basket. I started with the right hand gourd, and got carried away and nearly completed it. Next, I added cadmium yellow medium and cadmium orange over the under painting of the center gourd. A little white added to the yellow starts to define the highlights. I changed the yellow stripes of the center gourd to a more cream color, and added the green markings over the cream and orange stripes in a random pattern. I painted the stems with a cadmium red wash followed with burnt umber, Windsor blue and cadmium red for the stem. I made a tracing of the drawing, roughed in the basket and placed it over the painting. I began building up the lines of the basket and wires. Note the two plus signs (+) on the tracing paper. These are registration marks, and there are two matching dots on the canvas to keep both aligned. I made a piece of “carbon” paper by rubbing a #4 B pencil on a small (3” X 6”) piece of tracing paper. I taped the large tracing paper to the canvas and moved the small piece of “carbon” paper under it to build up the weave and wire of the basket. Don’t try using real carbon paper for these lines, it will bleed through successive layers of paint no mater how many times you cover it. (I learned this the hard way). I used a # 2 pencil and medium pressure to draw on the tracing paper to transfer light pencil marks to the canvas. Working from right to left, I drew in the successive weave and wire loops by first using a thin violet wash over the light pencil lines. Then, I indicated the over-under pattern of the weave and loops of wire by darkening the violet at these points. I added a twisted line above the woven strips, keeping the same over-under weave pattern. I used more violet to “push” the weave under the wire by darkening the violet near the wire (Click on the photos to enlarge). As I worked across the basket, I added a wash of burnt sienna over the violet, then a wash of raw sienna, and finally a wash with a little yellow ocher for the highlight of the weave. I used a little white and yellow ocher to indicate the top, narrow edge of the woven strips. I kept working back and forth over the weave to balance the color of the woven strips. This is a little difficult to keep the over-under pattern of the weave, so I lifted the tracing paper frequently to check the progression. The wire was done with Windsor blue, burnt umber and white. I started to paint in some cloth under the basket, and some draping over the edge of the table, but found it too busy. This wasn’t working out, so I went for a plain mahogany table top, and painted the cloth out. As I worked in the wires, I decided to add a shine to the table, so I washed in some reflections of the wire at the bottom of the basket. I continued working the weaving and reflections in from right to left. I continually adjusted the bottom curve of the wire so it all appeared to lead to the vanishing point. I then added to the middle of the center gourd indicated earlier. 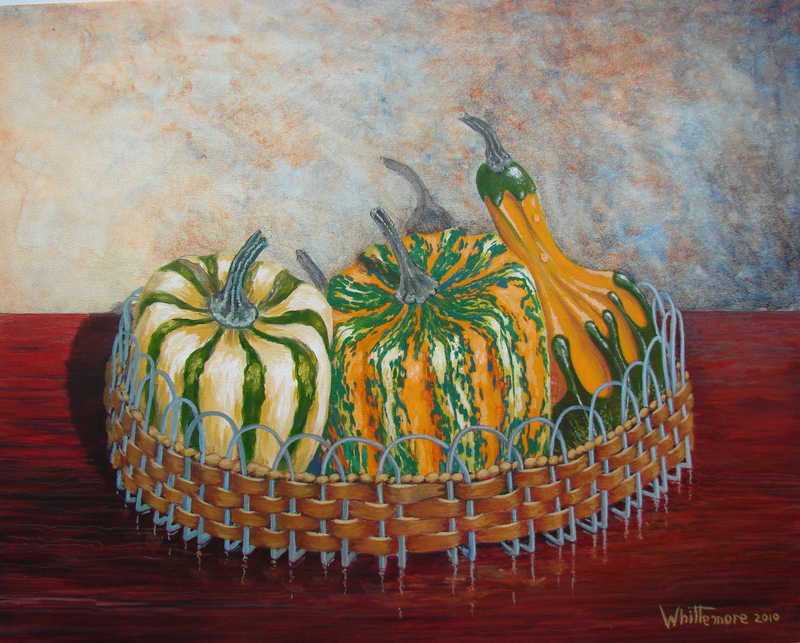 By now I had to paint in the left gourd, add the rest of the basket, and complete the table. I strengthened the shadows on the wall and the stems. I painted a stronger shadow to the left of the basket, and stronger light on the left side of the table. I added an acra red wash over the reflected wires to soften them and make it look like more of a reflection. I added a hint of the reflected weaving on the basket to the table top. Finally, I added a few suggestions of wood grain on the table with successive glazes of very thin paint lines. As you see, I needed to make several changes and adjustments as I worked on the painting. Don’t resist making changes, and constantly look for ways to improve your work. Many times, I just stare at a painting, and hold it up to a mirror to reverse the image. I even hold it upside down and look at it again. I also let a painting simmer for a couple of days (or weeks) if it’s not going well. Coming back to a work after a time can reveal mistakes or optional ways to enhance the painting. These gourds make an excellent subject because of the variety, colors and textures they have. Each fall I’m drawn to them and the ears of Indian corn at our local farm stand. I feel compelled to do at least one painting each year of these subjects, because they are so easy and fun to paint. They add a nice splash of color to my studio wall. Try it! The intricacy of your work is amazing! I was fortunate to meet Jerry Ford a few weeks ago and see some of his lovely work, including the bridge in Boston Common. He told me about your website. I will be following you.